Historicising Heritage and Emotions examines how heritage is connectedto and between people and places through emotion, both in the past and today. 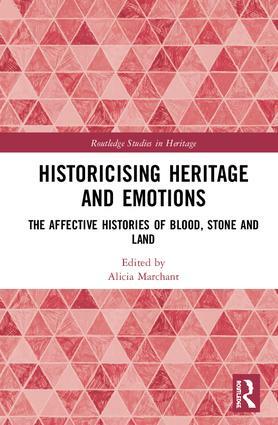 Discussion is focused on the overlapping categories of blood (families and bloodlines), stone (monuments and memorials) and land (landscape and places imbued with memories), with the contributing authors exploring the ways in which emotions invest heritage with affective power, and the transformative effects of this power in individual, community and cultural contexts. The 13 chapters that make up the volume take examples from the premodern and modern eras, and from two connected geographical regions, the United Kingdom, and Australia and the Pacific. Each chapter seeks to identify, historicise and contextualise the processes of heritage and the emotional regimes at play, locating the processes within longer historical and transnational genealogies and critically appraising them as part of broader cultural currents.Theoretically grounded in new approaches to the history of emotions and critical heritage studies, the analysis challenges the traditional scholarly focus on heritage in its modern forms, offering multifaceted premodern and modern case studies that demonstrate heritage and emotion to have complex and vibrant histories. Offering transhistorical and multidisciplinary discussion around the ways in which we can talk about, discuss, categorise and theorise heritage and emotion in different historical contexts, Historicising Heritage and Emotions is a valuable resource for students and scholars interested in heritage, emotions and history. 7. My Heritage - It is Not Just About Sticks and Stones - It is Timeless, Precious and Irreplaceable. Alicia Marchant is a heritage consultant and historian based at the ARC Centre of Excellence for the History of Emotions, Europe 1100–1800 at the University of Western Australia. Her work focuses on the histories of emotions and heritage, river histories, concepts of place, cartography and dark tourism.